Located in Wutai County, the Mount Wutai National Forest Park is a national scenic areas, as well as one of China's four famous Buddhist Mountains. Wutai, as its name indicates, consists of five platform shaped peaks. The East Platform or overlooking the sea peak is a spot where visitors can view the sunrise and the sea of clouds. The south Platform, or Splendid Peak is home to more than 100 species of rare flowers and grasses; hence a travel program named Viewing Flowers and Grasses on the South Platform. The West Platform, or Hanging Moon Peak, is an ideal place for people to appreciate the moon. The North Platform, or Yedou Peak, covered in snow all the year round, is the tallest of the five, with an elevation of 3,058 meters, making Mount Wutai the highest mountain in North China. The Central Platform, or green Rock Peak, is a place where people may view a natural wonder known as "dragons turning over stones." 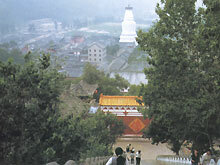 Mount Wutai, home to a great number of scenic wonders, is a mystical natural tourist attraction.